Portrait of Florida Governor Rick Scott in front of the Governor’s Mansion in Tallahassee. When 850 business magazine was launched in 2008, I photographed then-Florida Governor Charlie Crist in his office at the Capitol in Tallahassee for the cover of the inaugural issue. 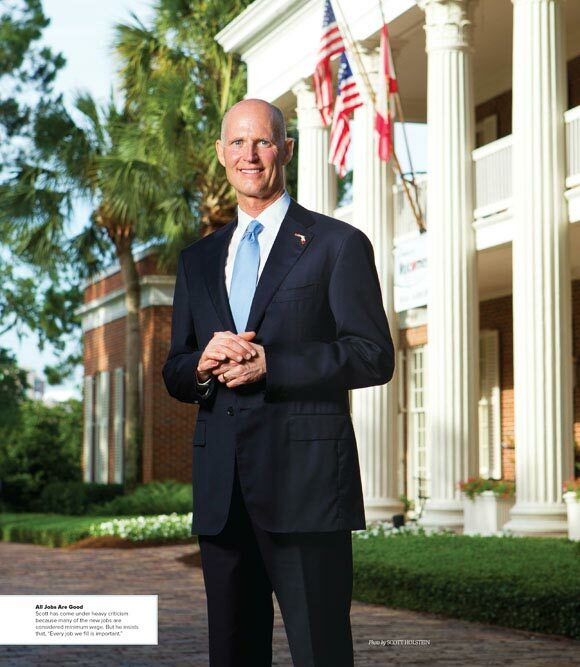 As the magazine recently celebrated its fifth anniversary, I had the opportunity to photograph current Florida Gov. Rick Scott on location at the Governor’s Mansion for the cover story of that issue of 850. The best way to photograph a politician or celebrity who has little time to pose for portrait photography is to get each shot set up in advance in order to be efficient with their time. That way, the subject simply has to walk onto one set for a few minutes and then move onto the next set. 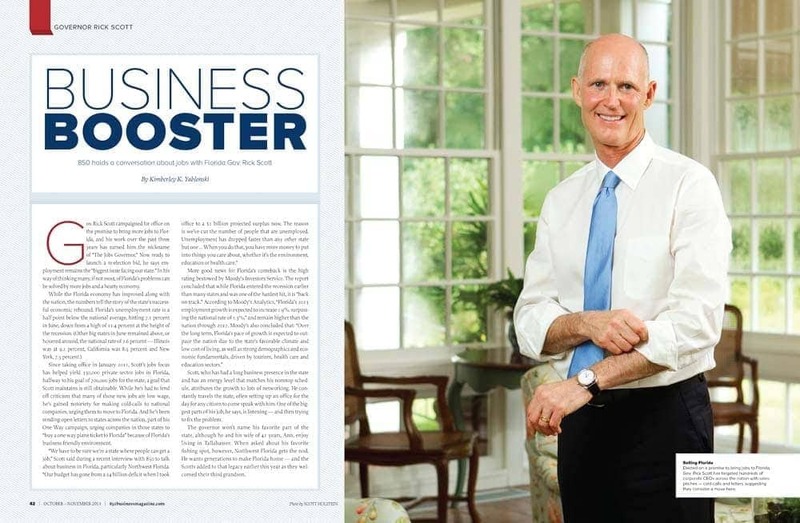 That was my plan with Governor Rick Scott, as I needed to create a cover and an inside spread with two different setups, one of which was slated to be a studio portrait against a backdrop. Due to his schedule and the magazine’s approaching deadline, we were piggy-backing the photo shoot at the same time as the interview, which had already been scheduled. So we secured permission with the governor’s people to arrive early. However, when we arrived the morning of the shoot, we were not granted early access by security, who only had us down for the official appointment time. Since I wouldn’t have time to get setup beforehand, I had to change my game plan; now both setups would be environmental portraits and I would do one before the interview and one after. Doing the interview between the portraits would buy me time to scout a new location and get setup. Portrait of Florida Governor Rick Scott in the Governor’s Mansion in Tallahassee. Once inside the mansion, I quickly set up in the Florida Room. My main light was a speedlight flash in an octa softbox at camera left and then I bounced another speedlight flash into the ceiling further away to camera right for fill. My exposure was dictated by the view through the windows. The governor entered and greeted us and I explained to him what we wanted to do with this shot. Since his campaign was about creating jobs, we wanted to have him rolling up his sleeves. He complied and I completed the first portrait. I told Governor Scott that I wanted to find a location for a portrait outside, possibly by the fountain with manatee statues. He suggested I check out a garden at another part of the property. As the interview began, I took off on my own to find a location. Out the front door I went, and I quickly rounded the corner. Just as I got to the garden Governor Scott had mentioned, a side door burst open and security guards poured out and around me. Apparently I was nearing the private entrance to the mansion. I frantically explained that the governor himself had told me to look at this location. 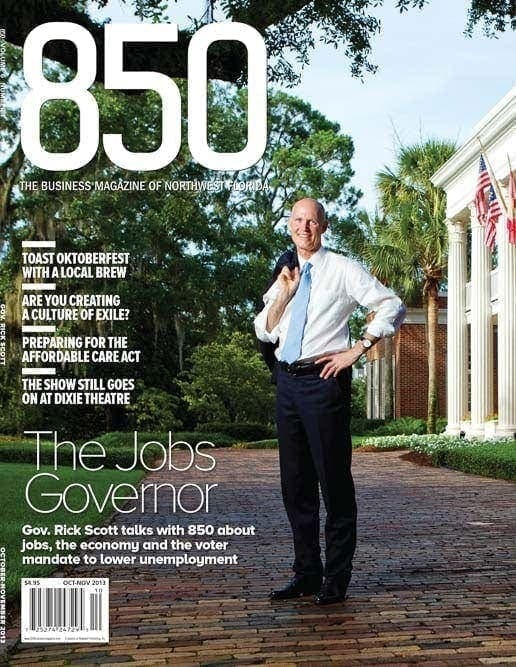 Portrait photography of Florida Governor Rick Scott featured on the cover of 850 business magazine. From that point on, I had a security shadow with me as I did the photographer’s pace back and forth between potential locations. I finally settled on photographing him at an angle from the front of the mansion, which in the end would become the cover. These shots were done with one light; the speedlight flash in the octa softbox. When the interview was finished the governor, flanked by the entourage of magazine crew and security guards, came outside to finish the photo shoot. I explained what we wanted to do for this shot and we completed several variations. Governor Scott was extremely patient throughout the photo shoot, despite the time crunch. Afterwards, he even made time to chat with us personally before being whisked away to his next engagement.